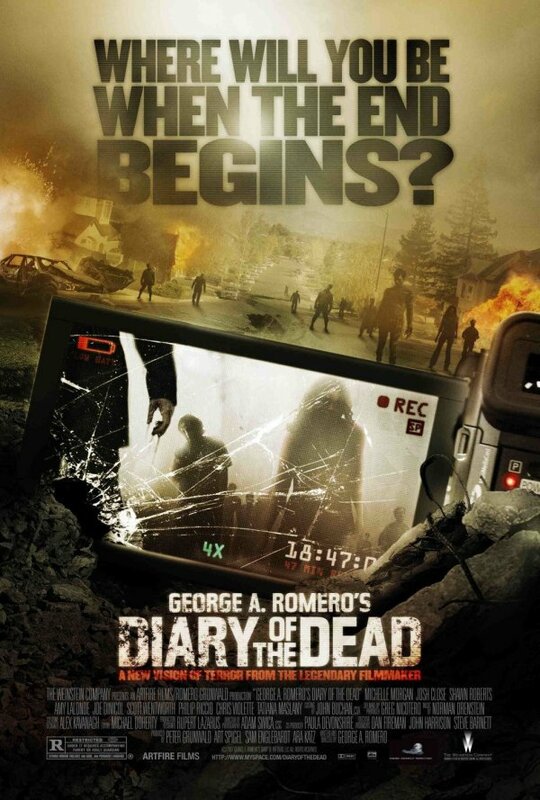 Diary of the Dead is the newest zombie film from the genre’s master George Romero. One big difference between this film and Romero’s previous efforts is the use of handheld cameras operated by the character’s to tell the story, a style similar to the one used in Blair Witch and, more recently, in Cloverfield. The poster clearly incorporates that by showing a small camera still filming even tough it’s owner is gone. Is that, the handheld camera in the image, enough for people to understand the style that the film uses? Probably not. I understand that the camera is a reference to that only because I already knew what the film was like. If I didn’t know anything about the movie the partially shattered and abandoned camera would probably look like just another sign of the apocalyptic chaos presented in the whole image. I’m not sure how far they should have gone to get the movie’s style across in the poster tough. This is one thing that is specifically hard to convey with a still image, and I think the current approach is a decent compromise. People who are already “in the known” get the reference and are reminded of what the movie is like. Everyone else get that this is an apocalyptic zombie movie with some modern elements. That said, the poster’s execution in general is very meh. The sense of ongoing chaos and doom is obvious, but the image lacks any strong and memorable elements. With the exception of the camera it’s a very generic looking zombie laden landscape. And the choice of colors is rather dull. In the end, there is not enough in the poster that could make this film stand out from every other zombie movie out there, nothing that makes it look truly special or unique. It’s just one of those things. Not a bad poster, but a very forgettable one. I’ll repeat a comment here that I left on Chris T’s Movie Marketing Madness site about this poster, because I’m desperate to hear an answer and he apparently doesn’t have one – that and the fact that I’m criminally lazy. Why aren’t the zombies seen in the viewfinder – in REC mode – not physically in front of the camera? Now that’s a good way to shut me up. Well done, sir!